Charge your tablet and your phone simultaneously. Planning an international business trip or vacation? Now you can keep your mobile devices charged while you're away, without having to worry about whether or not the adapter you use at home will work overseas. The versatile travel charger ships with interchangeable power plugs that let you plug in and charge your devices nearly anywhere you go around the world.Plus, you can charge two of your devices at the same time. This dual-port USB wall charger lets you charge two mobile devices at once, using a single USB wall charger, so you won't have to wait until one of your devices is fully charged before charging another.The wall charger includes a universal power adapter, which lets you plug in to any electrical socket almost anywhere in the world. So, no matter where you are traveling to, you can rest assured that you'll be able to keep your mobile devices charged and ready to use.With one 1A port for charging your smartphone or iPhone, and a 2.4A port for charging your iPad or other tablet, you'll always have the necessary charging power for your mobile devices. Whether you're charging two phones at the same time or charging a phone and a tablet, you can ensure all of your mobile devices are ready when you need them.The portable USB wall charger features a folding North American plug that tucks away nicely to fit inside your laptop bag, purse, backpack or other carrying case, making it the perfect mobile accessory for any carry-on. 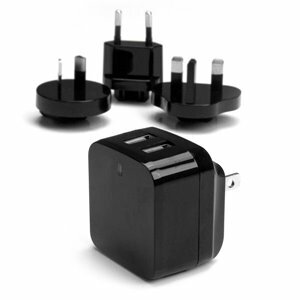 Plus, you can easily throw in the correct international plug for your destination and you're all set to go.Once you land you can swap out the plugs and be ready to charge in the airport, in your hotel room or just about anywhere you can find a wall outlet.Some mobile devices such as certain Samsung and BlackBerry devices use proprietary power connections which are not compatible with aftermarket chargers. Please consult the manufacturer's documentation to ensure compatibility with the USB2PACBK. Please Note: Some mobile devices such as certain Samsung and BlackBerry devices use proprietary power connections which are not compatible with aftermarket chargers. Please consult the manufacturer's documentation to ensure compatibility with the USB2PACBK.